This PDF 1.3 document has been generated by Word / Mac OS X 10.8 Quartz PDFContext, and has been sent on pdf-archive.com on 14/10/2015 at 21:29, from IP address 87.211.x.x. The current document download page has been viewed 451 times. File size: 189 KB (15 pages). Hans-Georg Gadamer, ed. Lewis E. Hahn. (Open Court: Chicago, 1997). Hermeneia. An Anatomy of History and Ab-wesenheit. in the world's past that has since become light. into a consistent and unified whole. text of change, and to articulate, his own mythos. existential context the concept of baru-sumphoros: heavy-nexus. played that one can be called truly happy. whom death has cast its dis-membering shroud. is to relate things that have in fact come about (Aristotle 1979, 1451a36-1451b11, 27-32). conscience, but in [their] confrontation, in their practice, and in their common life&quot; (MerleauPonty 1968, 47; 1964, 55). seem to fit together, the sculptor creates once again an integral and related whole (Statue). poetic invention: the making of histoire-Dichtung (Merleau-Ponty 1968, 47; 1964, 231). neo- or pseudo-[H]istory&quot; (Aiken 1991, 233). 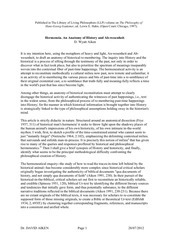 secondary consideration in the philosophical re-membrance of History. 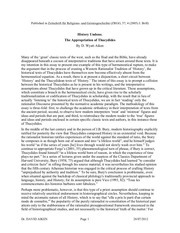 Myth Out of History.&quot; in Theologische Zeitschrift, vol. , pp. Alain. 1958. Les Arts et les Dieux. Paris: Éditions Gallimard, La Pléiade. Aristotle. 1979. The Poetics. Paris: Belles Lettres. University of Notre Dame Press. Eissfeldt, Otto. 1934. Einleitung in das Alte Testament. Tübingen: JCB Mohr Verlag. Frye, Northrop. 1957. Anatomy of Criticism. New Jersey: Princeton University Press. Methode. Grundzüge einer philosophischen Hermeneutik. Tübingen: J.C.B. Mohr. -----. 1986. Gesammelte Werke, Band II, Hermeneutik II. Wahrheit und Methode. Ergänzungen Register. Tübingen: J.C.B. Mohr. Husserl and the Idea of Phenomenology. Edited by Anna-Teresa Tymieniecka. Holland: D.
-----. 1992. &quot;Reflections on my Philosophical Journey.&quot; Trans. Richard E. Palmer. Mimeo. Gide, André. 1958. Les caves du vatican. Paris: Gallimard. -----. 1968. Paludes. Paris: Gallimard. Heidegger, Martin. 1980. Holzwege. Frankfurt am Main: Klostermann. -----. 1979.Sein und Zeit. Tübingen: Max Niemeyer Verlag. Herodotus. 1990. Histories. Cambridge: Loeb Classical Library. Hölderlin, Friedrich. 1977. Werke, Briefe, Dokumente. München: Winkler Verlag. of History. New York: The Bobbs-Merrill Company. Phenomenology. Evanston: Northwestern University Press. Kisiel, T. 1972. 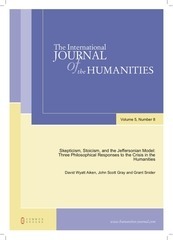 &quot;Repetition in Gadamer's Hermeneutics&quot; in Analecta Husserliana, Vol. II. 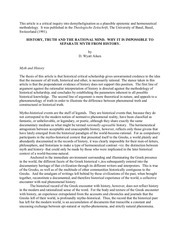 The Later Husserl and the Idea of Phenomenology. Edited by Anna-Teresa Tymieniecka. Holland: D. Reidel Publishing Co.
Kundera, Milan. 1984. The Unbearable Lightness of Being. New York: Harper and Row. Löwith, Karl. 1949. Meaning in History. Chicago: The University of Chicago Press. Merleau-Ponty, Maurice. 1964. Le Visible et l'Invisible. Paris: Gallimard. -----. 1968. Résumés de cours. (Collège de France, 1952-1960). Paris: Gallimard. Unzeitgemässe Betrachtungen. Sämtliche Werke, Band II. Stuttgart: Alfred Kröner Verlag. -----. 1964. &quot;Der Fall Wagner.&quot; Sämtliche Werke, Band VIII. Stuttgart: Alfred Kröner Verlag. Ranke, Leopold von. 1973. 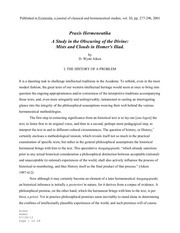 The Theory and Practice of History. New York: The BobbsMerrill Company. Simonnet, Dominique. 1992. &quot;Quand les femmes rattrapent l'Histoire&quot; in L'Express (Feb. 14). Unesco. 1966. Kierkegaard vivant. Symposium in Paris organized by Unesco in April 1964. 'interprètes' du logos.&quot; Cf. Gadamer 1986, 2:93.
objective world of mathematically describable a priori, is the world&quot; (Gadamer 1972, 181). following the whim of subjectivities&quot; (in Simonnet 1992, 47). and &quot;Hermeneutik und Historismus&quot; (1965). seinen Ausdruck&quot; (Gadamer 1986, 134). who is there (an-wesend), is to speak of the God(ot) who is not (ab-wesend). of continuity on that which would otherwise remain a dis-continuous cluster of happenings. everything that shall ever be said, and yet permits us to create it&quot; (Merleau-Ponty 1964, 224). edition or the Belles Lettres edition. which was intended by the author&quot; (Kisiel 1972, 199). Herodotus, see Herodotus 1990, III:103, 131; VI:14, 161.
the logos endiathetos or the logos of construction, as an activity of iterating the Lebenswelt. expression--a philosophical construction, through poetic mimesis. Cf. Gadamer 1986, 2:371. Gadamer 1986, 2:100-101; 2:124; cf. 2:405-406.
could &quot;in fact&quot; have experienced (Aiken 1991, 229). This file has been shared by a user of PDF Archive. Document ID: 00308161.